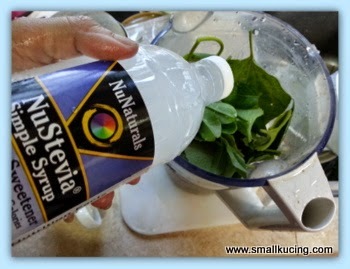 SMALL KUCING: Healthy Smoothies with NuStevia Simple Syrup. Lately Papa have been gila babi crazy about pork and other meat. Must have been eating too much meat and started to have these headaches. Coincidentally, Mamarazzi saw a member of the gardening group posted about making smoothies out of herbs in the garden for good health. She was apprehensive at first coz mixing so many types of herbs...drink liao won't lausai meh? (Lausai : diarrhoea ). The member said no lausai so far. Mamarazzi don't have much. Just some Aloe Vera, Daun kadok(betel leaf), mint leaves, java ginseng, pegaga(Pennywort), Ulam raja (Cosmos caudatus), basil and indian Borage. Wokay.....just hentam . Throw in some ice and start to blend. First time, Papa drink this...he said it have a too "green" taste which he not fond off. 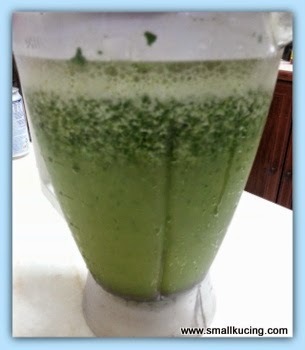 Second time making this, Mamarazzi added NuStevia Simple Syrup. Taste much nicer. Make it easier to drink. At least it's much cheaper and healthier than buying fruit juice to drink. Yaloh. 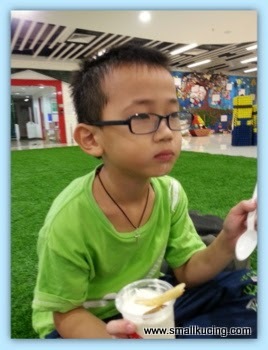 Look "cooling" and am sure laosai if drink too much. Hehehe. Ask papa to cut down on meats. Too much acid in the body, not good. Cause body ache and easily sick. Healthy and I agree cheaper to make at home. With those herbs you grow, why not?? yeah... eating too much meat also need to switch to something "ching ching dei" lah... people say "sik doh wooi jai" mah.. hmmm, but everything also herbs ah?? no wonder got that "greeny" taste lah, haha!! Uncle SK didn't expect it's all-herbs smoothies leh, just thought like adding a little bit of the herbs into other veggie or fruits only.. but this Mamarazzi really go and blend all the herbs and herbs only woh, errr, Uncle SK also a little taken aback lah, hahaha.. maybe next time besides adding just NuStevia Simple Syrup, can actually masuk some fruits or veggie lor, should taste nicer gua?? Looks very refreshing at first glance.. But like papa said, will have the 'chau cheng' taste kua.. I've seen friends blending all kinds of combo - mint, celery, dragon fruit, mango, taste ok wor..
Maybe can try adding pineapple? At least a substitute on the syrup. Small kucing is so thin, need to eat more, no need to drink the green green taste drink. i hope the shakes help. I do not have the syrup. But I did recently buy the Stevia packets to put in drinks and such. Have not tried it yet. Also I eat yogurt that is sweetened with Stevia, it is good. I guess you removed the skin of the aloe vera, used only the jelly inside? I hear the skin is poisonous. Herbs smoothie?? Yucks!! No thanks!! Meow is such a thoughtful wife, blending green juice for hubby. Good! I also steamed sweet potatoes for my jin jin. Well now you are starting to make things like I make. I still can't take green smoothie. Don't like its green smell. 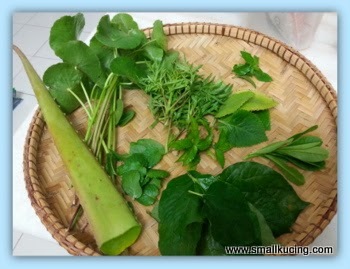 Aiyo, looks like a lot of herbs to me, my hubby sure won't drink this lo. I think I better stick to my ambra juice. Haiks! We have this Doctor Mamarazzi who blends up wonders! i salute her innovative ideas to hentam this and that. Those greens are very good to detox the gila babis.